LaVerne Shank, a.k.a. Vern, grew up around Philadelphia, PA with an early start in the music field. While in school, Vern was in band, chorus and stage and he also played guitar. Vern was cast for a small part as an extra in the movie "Witness" starring Harrison Ford that was being filmed in his old hometown. The experience made Vern catch the "bug" to go to "Hollywood". Upon graduation, he moved to L.A. and attended music school, playing in a band at age 19-22. During his tenure at the school, Vern took a few film classes for acting and tried his hand in writing a few scripts. He also DJ'd a bit on the local college radio station, which at the time aired on the campus and around the area outside of the school. It was a hip station for the students. After several years, In 2000, Vern's business partner Art moved to Burbank/ L.A. to "head up" the music label end of things where it made perfect sense to be in the music biz in the "City Of Angels". Vern had orignially planned on going back to L.A. also, but for personal reasons, moved to Florida instead to expand the DJ company and entertainment in Orlando and the coastlines of sunny Florida. With the demise of The Blizzard in 2006, Vern opened up a small music store called the Flagler Music Factory which gave lessons for guitar, bass, drums, keyboards and vocals. The store also sold musical instruments and accessories as well. As the economy began to tank shortly thereafter because of the the market crash and the housing market crunch, the recession caused the store to slowly loose ground. Unfortunately parents could no longer afford after school lessons and the students began to subside. He made a tough decision but eventually was forced to close it just 2 1/2 years later. In 2009, with Pyramid still in full force Vern returned to radio as well and was hired as the "live" DJ for a different radio station, Beach 92.7 FM in Florida for remote broadcasts requiring a jock to be present during radio sponsored events. Through these years, Vern and Art remained in close contact on both business and personal levels. Inspired by Art's successful independent music label in California, Vern expanded his own business in 2010 to include an indie label and artist management company under the name Pyramid Music Productions. The first musician signed to Pyramid's label was Top 40 Dance artist, Mark E. Walker; formerly of MCSC, Stevie B. and C+C Music Factory fame. Mark's debut EP titled "Here We Go" was released under the Pyramid Music Label in 2010. In early 2011, Vern co-wrote several songs with Mark, including "Into the Future" featuring legendary rapper, Freedom Williams of C+C Music Factory. These songs were released in digital format under the label along with the video of "Into the Future" (Mark E. Walker; feat. Freedom Williams). Together, Vern and a fellow associate, Dave Grabner, helped negotiate a deal to sign Mark to Ritmo Records, a well-established dance label. During the summer of 2012, Vern launched his own band project, “The Cherry Drops”, a retro power-pop band with a 60's and 70's feel and yet with a refreshingly new rock sound. He is lead singer, musician and principal songwriter of the band. The band's debut release will be coming out late Spring of 2013. 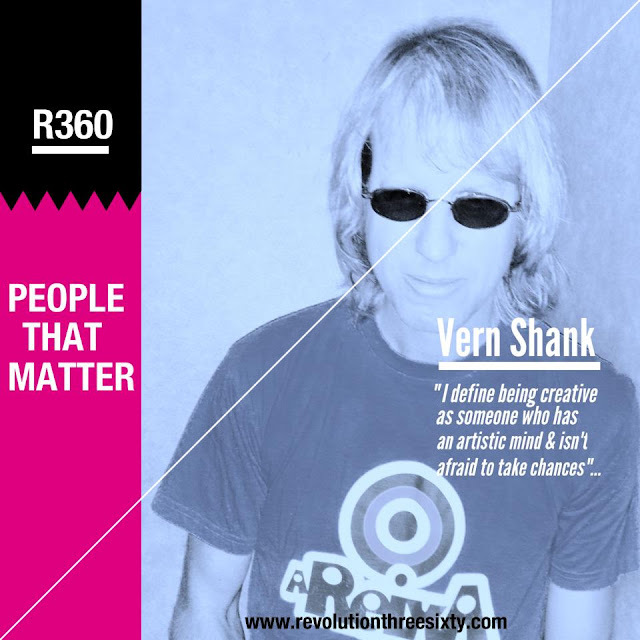 Vern still finds time to run his DJ business along with the band label & artist management company and has re-visited his screenwriting projects. He started to write films and television screenplay projects again. His latest script is a sci-fi comedy, fantasy movie titled “Transference”. Vern maintains residence in both Florida and Burbank, CA. for his business ventures. Most recently, Vern teamed up with Chris Lash, one of the previous owners of the Blizzard radio station to create Surf 17 (Surf 1700), a Florida-based radio station set to hit the airwaves in April 2013. Vern and his business partner Chris co-own and run the station directly on the Atlantic Ocean at The Flagler Beach Pier bringing beach & island music with a happy, sunshine, pop oldies feel across the airwaves. The station will stream online and will be available on phone apps, such as Tune-In Radio. Vern will be broadcasting live from the pier in Florida for the months he is there and will broadcast remotely on the station from California with special radio station computer software when he is in CA. R. Firstly, congratulations on all your outstanding achievements, from business entrepreneur, artists management, disc jockey, screenwriter, and more recently lead singer of your new band "The Cherry Drops." Is there anything that's missing from the mix? VS. Through the years, I have been blessed and very grateful for my achievements in the entertainment fields. My career within this field, has been somewhat diverse, however I have always felt as if it somehow always seemed to tie in together. After all... it’s all in the world of entertainment,I do not believe I have missed anything although I do wish to continue getting better and better in these particular areas. However on a side note, since you asked specifically if anything is missing from the mix I can say as a very amateur surfer, I guess my wish list would be that I've always wanted to be a great surfer. R. What does "being creative" mean to you? VS. I define being creative as someone who has an artistic mind and isn't afraid to take chances. Getting out of your comfort zone and leaving a steady job to pursue your own endeavors is never easy. One can never stop trying to be the best that they can possibly be once they take that step. Failure is not an option. If I may give a few words of advice to anyone, it’s never give up the dream but follow it to the ends of the earth. R. Can you describe the time when you first realized that music was something you absolutely had to do? VS. When I was 5, my father bought me a beginner's guitar for me for Christmas. I began writing poems that later turned into songs. I would also take old-fashioned tape recorders and record myself singing in four part harmonies as a kid. When I was 10, I discovered my mom and dad's record collection. This experience introduced me to a whole new world. By the time I was 16, I had hundreds of 45 records and albums of my own. It was at those monumental moments that I realized music had to be a part of my world. R. How would you describe your music/art/entertainment for the audience if they have never seen you before? VS. Energetic, fun, tireless & ready to rock. A lot of people have told me that I’ve always had an over abundant amount of energy, kind of like the Energizer Bunny that keeps going, and going and going. I try to put forth 110% of myself in everything that I do. Whether DJing, singing or writing I always try to be upbeat and on the go. Needless to say, I do not sleep very much. But I feel you never get very far moving slowly. R. What do you love about being a disc jockey? VS. There are two types of DJing that I do. A mobile DJ entertainer and a radio DJ. As a live mobile DJ for parties and events, I love to feel the energy that I help create through the music that comes from the people on the dance floor. Spinning and mixing the actual tunes, jumping out there on the dance floor, getting involved and interacting with the crowd and guiding and teaching them dances are just a few things I love about being this kind of DJ. But most of all knowing that I shared in a special day in someone’s life through a party or a wedding. I always feel great when I receive a thank you note from a bride & groom telling me that I made their wedding day special. That makes me feel good that I have touched their lives in a small way and will be always be remembered by them. Just knowing that I made an impact in a moment in time they won’t forget is an awesome feeling! As a radio DJ, I love opening up the microphone knowing that I’m being heard in someone’s car stereo, home, phone app or computer. It’s a great feeling to know that they are listening and I am a part of their day. When I chat over the air I try to speak in such a way as if I am talking to just one person. In other words, as if I am talking to just them. It becomes a personal experience. For example... instead of saying “I hope ALL of you are having a great night tonight.”, I say “I hope YOU are having a great night tonight”. It’s a small trick of the trade, but it goes a long way with the listener. Just knowing that there are people tuned in to me is a great feeling knowing they are listening. When they call in to the station for a request or dedication I know that they are out there and that I have perhaps made an impact in some small way to make their day just a bit brighter. VS. The Cherry Drops were formed in the summer of 2012. The group’s name comes from my love for 60's & 70's bubblegum, garage rock & power pop. Some of the bands of that genre were named after fruits such as Strawberry Alarm Clock, The Lemon Pipers, The Electric Prunes, Moby Grape, The Raspberries, etc. So hence, The Cherry Drops. The songs are fun, bubble gum happy songs for the most part. The opening track Pop, Pop (‘Til You Drop) is about a day at the beach where the main character’s girlfriend takes off with a muscle bound beach dude. He later finds her stranded by the side of the road and buzzes right past her leaving him with the last laugh. “Let’s Bug Out” is a classic road trip song about getting out and hitting the road to Southern CA.and never turning back. “Outta Sight” is a party anthem song about babes, booze, bands and waking up the next morning not remembering anything, a theme you could hear like something out of a soundtrack inspired song along the lines of “The Hangover” films. “Summertime Is A State Of Mind” is a harmony drenched song reminiscent to a classic beach boys tune with a retro, yet fresh approach. The album closes with a song called “Cherry, Lemon & Marmalade Pie”. It’s about a state fair/ carnival in your town ending as it rolls away from your town but promises to be back soon. There are 14 tracks on our debut album. It has been defined as a groovy pop sound, like something you thought you've heard before and yet never have. Throw in a blender the harmonious sounds that are reminiscent of The Beach Boys, The Beatles, The Archies & some Partridge Family along with a little flare of Tom Petty, The B52's, The Raspberries, The Sweet & Cheap Trick, mix it up and "viola"... out comes the sound that is The Cherry Drops. R. What do you think your "biggest break" or "greatest opportunity" has been so far in your musical career? VS. I guess my biggest career break was not so much of a break as it was actually more of a life changing moment in my life. It was when someone really opened up a door that really helped define me when I was young. I guess you could say they gave me a chance or an opportunity. My world completely changed when I was hired to run a music store. Working at that music store with records, tapes, CD’s, videos etc. as a young man really opened my whole world to encompass the idea of what the music & film industry was. It was the final stage and the last point before it got into the hands of the consumer. I loved talking to the customers and seeing the joy that music and film brought to people’s lives. I knew right there that I needed to be around entertainment from then on in some fashion. It was the stepping stone that launched my entire life moving forward. I thank the powers that be for that moment lining up just right to be hired that inspired me to begin all my other musical and entertainment journeys moving forward. R. You've heard of the term "starving artists" before, how do you cope with obstacles? VS. There were some very lean times along the way indeed. Not having very much to show for and working very hard but not ever seeming to get very far. I believe that a “starving artist” not only refers literally to someone who doesn't have much materialistically speaking, but it also refers to someone who doesn’t seem to be getting where he or she wants to get in life. This causes more of an inner sadness at whatever failure you believe you may have had or a feeling as if the artistic endeavor you are doing is not working. In one of your earlier questions you had asked me about being creative. Well, I kind of answered this question here somewhat before as I had stated that you can never stop trying to be the best that you can possibly be. Failure is not an option. If something doesn’t work you have to know when to slightly change directions, try it a different way and use your creative energy with a new plan. Perseverance will help you to conquer those obstacles. As the old saying goes I believe that there isn’t anything you can’t do if you put your mind to it. R. Do you feel the economic crunch has hurt the industry, or do you have some other promotional tips to help support the music industry? VS.Yes, well the industry has suffered a bit considering the fact that major music labels & film companies are struggling but the industry is always re-inventing itself even in a tough economic situation. The idea is now of course to promote yourself and your craft heavily. Indie music labels and film companies are now getting some well deserved attention. Also, don’t forget...things work in circles. Sometimes something is groundbreaking, After that groundbreaking concept it is followed by many others similarly. Then it moves in another circle and finds a new concept, My advice is to not to be afraid to dig deep and find something that can resurface again. Always be willing to try something new in your entertainment field no matter what it may be. Flexibility to change gives you new experiences. New experiences makes you a well rounded artist. Never forget you can re-invent yourself just like the industry does. Remember though, you’ll never know until you give it a shot and be willing to learn. Lastly, the entertainment world is definitely a business for sure, but for me it is more of a feeling, an emotion and a personal expression of yourself. Live your dream! Awesome article, Verm. I felt like it gave me new insight into my brother. Love u, bring!